With dedicated backhaul and QoS settings, the M9 Plus is a welcome addition to the mesh router space. 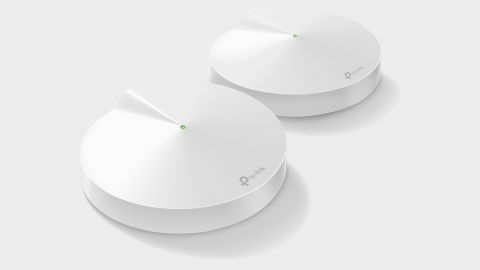 TP-Link's initial entry into the mesh network arena was their Deco M5 model, which debuted in 2017. In our review, we praised it for the compact art deco design, and the "smoothest setup ever of any mesh kit," via the integrated smartphone app. However, it also fell short of the competition with less bandwidth using a less robust dual band design, with lower prioritization of gaming traffic in our testing, resulting in lower FPS scores on our standard gaming test. The true mesh design of the Deco M5, but without a dedicated backhaul solution, caused it to be beat in the benchmarks by several more powerful hub and spoke mesh systems of last year. Setting up a mesh system too often turns into a timely project, but thankfully not for this M9 Plus. While all the mesh systems we have tested to date perform setup via a smartphone app, the process for the M9 Plus is quite streamlined, and dare we say simple even for a neophyte. Utilizing the Android app, (iOS available) the first disc gets connected via an Ethernet cable to a rebooted modem. The M9 Plus has a single multicolor LED that initially starts white, and then switches to a flashing blue when the app is ready to proceed, which takes about two minutes. The app then allows a choice for naming the disc. After the initial disc, the user is prompted to create an account with username and password via the TP-Link app. Once done, the app will connect to the disc, and its location can be designated to a room, with a custom option available to be more descriptive. The user is then prompted to select an SSID for the wireless network, as well as a password. The process is repeated for each additional disc added to the mesh network, which is done wirelessly. The rear of each M9 Plus disc has a pair of Gigabit Ethernet ports. For users that will need to connect a large number of wired devices, such as a computer, network printer, and a NAS, they should plan on using a wired switch, or else their devices will end up scattered around with the discs to be able to find enough ports for the connections. The TP-Link Deco app offers quite a bit of control over the network. This includes the ability to check for, and perform a firmware upgrade, which is handier than having to head to a browser based web page to keep the device up-to-date. Another useful feature is the integrated antivirus monitoring, from Trend Micro. Unlike the antivirus software for your computer, having it at the level of the router protects the entire network, which can stop attacks before they even even get to your computer; a generous three year subscription is included with the hardware purchase. From the outside of the box, this M9 Plus hardly screams gaming, as the off white exterior hardly fits in with modern gaming oriented accessories often adorned with RGB LED's and logos. Rather, in the app there is a setting to prioritize gaming traffic, which is known as router QoS, which in theory serves to get the gaming traffic through, even when the overall residential network gets bogged down with other traffic; the common case is that gameplay suffers when another user is watching an HD video stream. Read on to see how it worked, but we were impressed that not only was there a 'gaming' setting, but there was also a custom setting that lets you fine tune to balance gaming against VoIP and streaming traffic, especially as some other mesh kits have too often fallen short in this exact area. While the hardware and specs promised an improved experience, we were eager to see how it translated into the performance of the M9 Plus, so we put this kit through the battery of tests that we use for mesh routers. First up is raw throughput, and the M9 Plus held its own, with strong results on the 5 GHz band, including 309.7 Mbps on the close test, which dropped to 175.2 Mbps at the far distance connecting to a satellite disc. The 2.4 GHz throughput speeds are a respectable 79.3 Mbps at the close distance, and 68.5 Mbps at the further distance; neither score is the fastest we have seen, but overall towards the top of the board. With recent routers, the total throughput does not tell the whole story. This is where our network congestion testing comes in, to see how a mesh kit handles a congested situation. Here, we quantitate the gaming performance on our test game, Medal of Honor: Pacific Theater, while simultaneously running five 1080p HD videos on YouTube in the methodology developed for our mesh router buying guide. On the network test is where we are most impressed, as we see FPS on the game at 27.437, which bested our previous pure mesh champ, the Portal, which managed 25.433 FPS on the same test, and our hub-and-spoke leader, the Amped Wireless Ally at 24.717 FPS. Equally impressive, the videos streamed with a dropped frame rate of 1.4%, one of the lowest obtained to date in our testing. Furthermore, this was confirmed with PingPlotter, the graphical traceroute software, which showed stable communication via the measured ping test, and we quantitated this with no latency spikes > 100 millisecs, which correspond to gaming slowdowns as the network gets over congested.